The history textbook struggle of apartheid that is taught in schools is shorn of desire and dreams, of the pain of destruction wrought upon millions. Some years ago, while on a conference visit to Delhi, I purchased a copy of Letters from a Father to a Daughter for my 14-year-old daughter. I was especially moved by the gesture that prompted Jawarharlal Nehru to pen these lessons on the history of India before and after British colonialism to his daughter, Indira, from the isolation of his prison cell. One evening late in 2018, I wished I had had the same opportunity. Instead, I ranted and raved, and vented, directing my anger at my daughter as only an unworthy father would. Perhaps I am. I have no excuses. But something that triggered my frustration is the reason for pause. Let me explain. I sat down to assist my now 17-year-old daughter with preparing for her Grade 11 history exam. 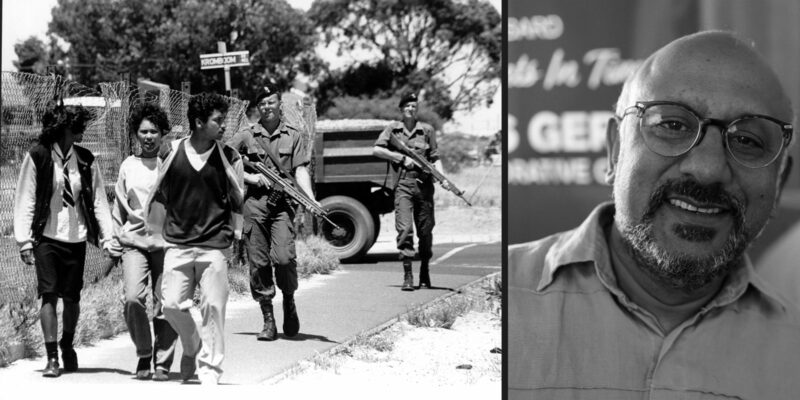 The subject matter was the demise of apartheid and the resistance to it – in that order. It was a history lesson with which I have been intimately involved since I was about her age, as a student activist in the schools of Athlone in Cape Town, in the civic formations and youth structures of the 1980s, and later in the higher education student movement in Durban as convenor of the Black Student Labour Committee at what was then the liberal English speaking University of Natal-Durban. I proceeded to describe the broad arc of the National Party’s failed reforms of the 1980s and the deepening resistance that flowed into the spaces of PW Botha’s pseudo-reform agenda. I animated, as best as I might, the discussion with talk about the struggles against the tricameral system, the dreaded pass laws, and the states of emergency under which I myself had been detained. All the while, I was being drawn back to a text which had rendered all of the contestation and deep intellectual work of unravelling apartheid to neatly packaged conglomerations of informational clusters about names of organisations, leading personalities, cryptic statements of opposition, and meaningless lists of dates and facts. Nothing was out of place, or necessarily incorrect. And neither was the sequencing of events questionable. This was History 101 of the struggle against apartheid. It was written for someone born after the fact, someone for whom this would be a matter of information retrieval at a board meeting with senior executives from the other side of the line. And it certainly would be sufficient knowledge to enter a South African university. Yet, I could not escape the uncanny feeling that beyond a familiar story, the students of my generation were being scripted as subjects of history. This, despite the fact that personally, I cut my teeth by attempting a political mode of speaking and thinking for myself in the 1980s, and later, tried my hand at a scholarly form of writing that refused dogma and questioned orthodoxy. With each undertaking, I was determined to nurture my intellect towards thinking my way out of the inheritance of that very racial formation that was being described to me in the class notes. As I proceeded through the material, admittedly more agitated than when I first set to work, I took care not to ascribe blame to the teacher (who is conscientious, qualified with a university degree, supportive and affirming), nor the school system, government or textbooks. All the while, I encouraged my young charge to deepen understanding, expand interpretation and extend the view of what the struggle against what some called gutter education, entailed. Look for the debate, forget the date, I suggested. She insisted that we focus on the notes that the teacher had given. Somewhere in our disagreement, something triggered a deep resonant note that recalled an interrogation session at the hands of a member of the South African security branch in 1986. He had insisted on representing the student movement to me, from the lofty heights of a self-proclaimed position of authority. The tactic was one of foreclosing competing interpretation, a skill honed in the every day of apartheid, where like a scene from Dickens, facts were everything, especially when they derived from the apparatus of power. History would be sealed, signed and delivered by way of a narrative form in which information and facts sufficed. History was diachronic, and lacking in depth and with no relation to the present. There was no need for interpretation, analysis, understanding or discernment of the debate that constituted the struggle against apartheid. There was nothing to link the 1980s to contemporary South African and global debates. It was just one drawn-out process of accumulation, a story, as Marx would have it, of Moses and the prophets. The students who challenged apartheid in 1976 and 1985 and who populate the story were inflamed with a sense of liberation before education, the notes suggested. The Black Consciousness Movement was about psychological emancipation and confrontation, not about the structural conditions of psychic power. While Biko was, we are correctly told, influenced by Fanon, Fanon had been severed from his intellectual tussle with the European enlightenment. Europe was in fact sealed off from the epistemic conditions of colonialism so that apartheid was supported by the misguided views of Margaret Thatcher and Ronald Reagan. From the perspective of the west, the geopolitics of the Cold War served to erase the humanistic, worldly and cultural milieu that sustained anti-colonial struggles. In all of this, there was no account of the technologies of power, of the interchanging use of hegemony and repression, of the work of dominance without hegemony and of the work of university discourse in sustaining apartheid’s discourse of race. Ultimately, the story of the struggle against apartheid is a variation of the theme of black on black violence, of the ANC’s supposed liberalism versus the militancy of Black Consciousness. Apartheid was outdated anyway. Liberalism had predicted that outcome. Nowhere do we learn about the contest of ideas about the best ways of forging a concept of non-racialism that was specific to both the ANC, PAC, and later, the Black Consciousness Movement. This is an argument that has been eloquently made by Ciraj Rassool, a historian at the University of the Western Cape. Instead, the struggle of apartheid is shorn of desire and dreams, of the pain of destruction wrought upon millions. Should we not be teaching a course on what is apartheid? Should we not be teaching about the history of the every day under apartheid? That night, as my words cut into my daughter’s future, I turned my frustration about what has become of a history that once promised a liveable future, emancipation and practice of freedom. The historian of India, Ranajit Guha once wrote that the one struggle that the British in India did not win is the struggle over historiography. Historiography is the story of how we narrate the history and to what possible futures. In South Africa, we have lost sight of that struggle. In the final analysis, I should not have resisted the school lesson, which encourages my daughter’s generation to write my generation from the other side of the tracks into history as a failure, and by some weird twist of fate, to return us to the Oedipal drama that now serves as an allegory of our limited South African national narrative.